There are two separate components to Photoshop Elements 10: the Organizer and the Full Photo Edit mode. The Organizer is where you manage photos, and the Full Photo Edit mode is where you correct photos for brightness and color, add effects, repair images, and so on. By default, the Adobe Photoshop Elements 10 icon appears on your desktop after installation; you can use it to launch the Photoshop Elements Welcome screen. In the Welcome screen, you can choose to visit the Organizer or the Full Photo Edit mode. Note that you have two buttons on the left side of the Welcome screen. The first is labeled Organize. The other button is labeled Edit. 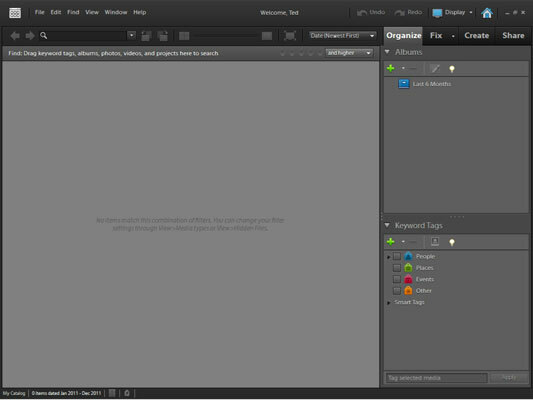 Click the Organize button to open the Photoshop Elements Organizer. The Organizer is your central Photoshop Elements media file cabinet where all your imported images, videos, sound files, and PDF documents are displayed in the current catalog file. The Edit button is used to open Full Photos Edit mode. In the right panel of the Welcome screen, you see two buttons. The top button is for new users of Photoshop Elements. Click this button to display a series of help tips for organizing photos, editing photos, and making various creations. 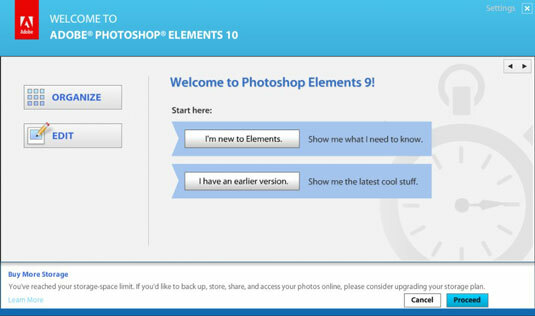 The bottom button is for former Elements users who want a quick glance at the new features in Photoshop Elements 10. Click this button to find information on how to easily integrate your photos with Facebook; use the new Spot Healing brush for repairing photos; match photo styles; create out-of-bounds effects; use enhanced printing for calendars, greeting cards, and photos; and try out some nifty new design templates for your creations. There’s a lot of cool stuff here, so be sure to toggle through the screens by clicking the arrows in the top-right corner. At the bottom of the Welcome screen, you find information on how to acquire more storage space for storing photos on Photoshop.com. This is a free service offered by Adobe where you are allocated 2GB of storage space for backing up your photos. If you want more space, Adobe provides additional space for a subscription fee. Read more about it by clicking the Proceed button at the bottom of the Welcome screen. Take a look at the Organizer. Click Organize to open the Photoshop Elements Organizer. If you’re new to Photoshop Elements, you see an empty media browser — this is the central panel in the Organizer window. If you’re upgrading from a previous version of Photoshop Elements, you are prompted to convert a previous catalog. If you already use a previous version of Elements, you already know how to import images. If you are a new user, then you should be looking at a window containing no image thumbnails.